RIO DE JANEIRO (Reuters) - The new chief executive of Brazil's Petroleo Brasileiro SA <PETR4.SA> is pushing for the ouster of two of the state-controlled oil company's board members, three people with knowledge of the matter said on Friday. 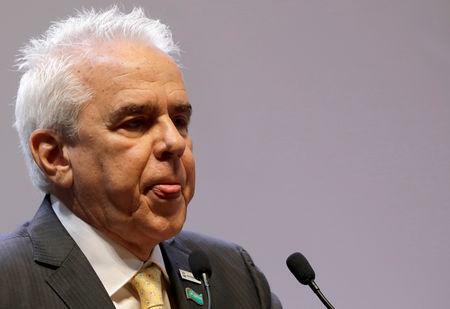 Roberto Castello Branco is seeking the resignation of two Petrobras board members, Segen Estefen and Durval Soledade, whose mandates were only supposed to end in 2020. Brazilian newspaper Valor Economico was first to report that Castello Branco was pushing for their exit. The people, who asked for anonymity due to the sensitivity of the matter, said that if the board members do not agree to resign, the government can call for a shareholders' meeting to elect new board members. One of the sources said the pressure for the directors' resignation is viewed within Petrobras as a threat to corporate governance rules approved as the company sought to shield the company from undue political influence. Such influence was found to be a big factor in the kickbacks and graft uncovered at Petrobras in Brazil's largest ever corruption probe. A second source said both board members were frequently at odds with Castello Branco's enemies when he worked at the company in 2015 and 2016. Chairman Nelson Guedes and board member Francisco Petros resigned earlier in January, and Jerônimo Antunes was appointed as interim chairman last week. Valor Economico also reported that the pressure to oust the board members was related to a "transfer-of-rights" dispute with the government, worth billions of dollars and related to a promising offshore oil area. None of the sources who spoke to Reuters confirmed that version of events. With the departure of Estefen and Santos, the new government would designate four of 11 board members at Petrobras, given the recent resignation of two other board members. Petrobras did not reply to requests for comment. In the past, Economy Minister Paulo Guedes has railed against the state's outsized role in the Brazilian economy, even proposing that Petrobras and other state-run firms be privatized or split up. Preferred shares of Petrobras were down 1.2 percent in late afternoon trading, compared with a more than the 0.15 percent decline in the benchmark Bovespa stock index <.BVSP>. Earlier this week, Petrobras said the country's audit court was analyzing a potential $14 billion government payment to the company to settle the transfer of rights issue. The Economy Ministry has denied that the final settlement will be that high.